How wide, long, high and deep is God's love? This exciting new StoryTelling Kit includes four favourite Lost Sheep Bible stories on an interactive CD-Rom, plus a Storytelling Booklet and an Operator Booklet. Runs on PC/Mac. 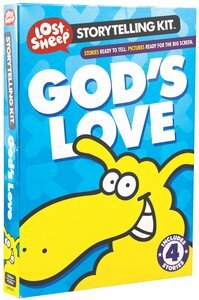 About "Storytelling Kit, God's Love (Lost Sheep Series)"
Customer Reviews For "Storytelling Kit, God's Love (Lost Sheep Series)"
Bold cartoons and large, colourful format make the Lost Sheep series ideal for bringing the Bible to young children - with a uniquely Aussie sense of humour! 19.5 x 19.5cm. Ages 4-8.